At Gate 27 in the international terminal in Sydney Airport I am surveying my colleagues on Flight PX2 to Port Moresby. They are stocky miners, wearing their Rugby League jerseys. There was also a man who was celebrating a 50th birthday, covered with aggressive tattoos declaring his allegiance to The Komodo trail. The Australians used to gather a few of them, who had helped as lookouts, for the annual ANZAC parade and cheered them. They called them the fuzzy-wuzzy angels heroes, deprecation and appreciation in one phrase as only the Aussies can manage. You couldn’t make it up. There were some nuns, a legacy of the rush to convert the few remaining souls that had not yet been harvested for Christianity, leaving dozens of religions to battle it out in churches and schools. And lots of tall proud looking islanders (if you can call them that, New Guinea is the second largest island in the world after Greenland), because there is a strong end enduring pride in the face and the eyes of the people of Niugini, like there was something a lot more important about travel they knew and the rest of us did not. First the name. A Portuguese explorer Jorge de Meneses thought the people here looked like those of Guinea, so he named it New Guinea. Afterwards an Englishman decided two long streals of offshore islands, ironically two of the places with the highest developed incidence of artistic endeavour, should be called New Ireland and New Britain. The parody was completed when they formulated a pidgin language to try to overcome the huge task of implementing laws and systems in a land of 830 languages. Confusion worse confounded. A new name for a national identity that was not anything like national identity like we define it in the west. Three second generation Tipperarymen, Australian born Mick Leahy and his brothers James and Dan, came up here panning for gold in the 1930s and found a million people here that nobody had heard of. The locals were pretty unique, uncontaminated by contact with the outside world. The Leahy brothers (they pronounced it lay-hee, which is closer to the Irish language original than the normal English translation) eventually found some gold and started about mining it with the help of the friendly natives who had not a clue what was going on. He gave them a shell for a month’s work, imported from Thursday Island and they were grateful. They also murdered more than a dozen locals on the march. He shot one man in the Kukukuku country, one man at Chuave, one man at Dotiwara, one man at Bena, one man at Wabag and an estimated nine people, including a woman, at Tari. At Tari the locals had planned to raid the camp and the chief gave the signal by throwing a spear aimed at the white man. The result was all of the Leahy party opened fire. So the Leahy version of the story goes anyway. Under the colonial regime you were supposed to register any killings of the local blacks, though these usually went unpunished. The Leahys never even bothered to register them. After the gold had run out the plantation masters of the coast shipped the highlanders down to the coast as labour for their farms. 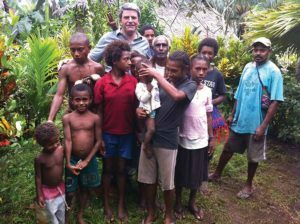 The descendants of the Leahys still run mining companies in PNG. 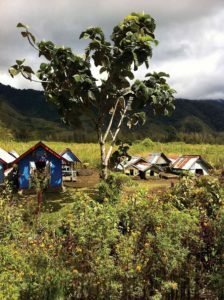 My hosts met me in Mount Hagen, and drove me to Rondon Lodge on a tortuously slow gravel road up through the forest past a disused sawmill past women and children gathering firewood and curious faces all gaping towards the vehicle. The landscape in the valley was reminiscent of Africa, maybe more Mauritius, with exotic green plants everywhere, bananas and coffee. When the Leahys crossed this path they expected to find the place barren and empty. Instead they found it marked out with well drained gardens of sweet potato. The people who saw them are mostly dead now. But Anis Waka, my driver from Wurup Pogla (“beds very cheap,” as in merry, the sign outside the local lodge says) told me about his grandfather. The grandfather who died, aged 101, in 2008, remembers the white men brought salt and tasting it for the first time. He told Anis that the big change in people’s lives was that it made log felling and timber work easier with the technology they brought, modern axes replaced stone age ones. The piece of technology that impressed them most? The umbrella. In a very monsoony country they were amazed by the umbrella. He was afraid of these white skinned people when first he saw them, but thought they were the spirits of the ancestors. The logic went that when people died at that time, their bodies were burned, their bones were collected and put them in the river. Now a group of white men had arrived with these pans and dirt , they went down to the river and collected river water in the pans. The people thought they might be their ancestors looking for their bones back, not Queensland adventurers looking for gold. They brought me on a tour of three villages. In Polga village there is a story of how a bigger more aggressive tribe the Nopka drove out a smaller tribe the Kauga. The Kauga came back at night and pretended to be departed spirits and scared the Nopka away. They commemorate the event in the village dance. They showed me how the women bury the umbilical cord of a newborn child beside the codlin plant. It helps delineate boundaries in case there is a family dispute. At Tokoe I met the village elders in full dress and they told me that their neck decorations indicate their wealth, a bar of wood for every ten pigs. Ten pigs is the bride price for a woman up here. Some of them have very many wives. The Seventh Day Adventists eat chicken because of a passage in the bible and because they believe that the bad spirits in the water are picked up by pigs. You get the impression that the layer which the Christian missionaries laid over the old religion is very thin indeed. As you pass the graveyard each grave is covered by a little house to house the spirits of the ancestors. There is a cross by the door to keep St Peter happy, but they don’t think they go to the pearly gates straightaway. The arrival of the sweet potato changed life here, like that of the potato in Ireland. Suddenly the small plots of the farmers that had produced taro in great quantities but with low yields, were transformed into highly productive farmsteads. Sweet potato is ubiquitous, two for breakfast, three for lunch, five for dinner. So are pigs. Everyone eats them and they are everywhere, baby ones trundling up the path, children carrying them, women herding them. Pig jaws line the roofs of the houses to showcase the wealth of the occupiers and how many happy dinners they have had. A pig, I am told, is always a cause of celebration, although sheep are entering the funeral menu of late (if you are not a Seventh day Adventist). They served me spicy prawns and rice on my arrival. And some local basket fruit, with delicious seeds you scoop out with a spoon. Later, in Madang, Lawrence Walep and Josephine Leo served me up a traditional dish of sweet potato, pumpkin, hibika (spinach), snakebin and yellow fin tuna. It was not exactly a traditional mumu (where animals are fed out of the same pit as the humans) and no taro, but it hit the spot and was served with the sound of the waves nearby. 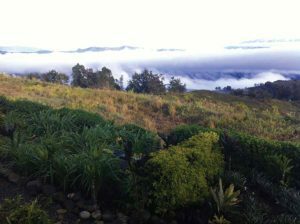 Rondon Lodge is on a hilltop at some great height, so high that in the evening you watch the white fluffy clouds roll in below your deck like giant cruise ships floating in to the valley, the great cloud of white at one end, streaks of fluffy white at the other, that leave the mountains on the other side visible above and below. It is a floor show, not the skyshow we are used to. The Wahgi River valley is stunning, with high mountains on each side and a big muddy ribbon serving as the river, with women washing clothes and children diving into one of the most spectacular example of soil erosion outside of the Himalayas. I felt like joining them. The predilection for scary looking masks takes a bit of getting used to. They had one in the bedroom and in the twilight, something that happens frightfully early when you are nearly directly under the equator. It has the effect of turning you into a six year old with an obsession about a monster in the cupboard. Except this monster is very much IN my room. And the noise of heavy rain added to the atmosphere. It was supposed to be dry season but it bickered on me the night I arrived in Mount Haven. The forest chorus line is filled with the Chirrup of grass hoppers as the light tails off. It rises in volume until it drowns out all other sounds, real and imaginary, for this is a land where every room and every hallway is decorated with scary masks . The electricity failed and we had glorious darkness. The grass hoppers came to full chirrup at the same time as the generator switched back on. In Madang I saw the most amazing net for carrying a baby, on the back of its mother. The mother, Cogoi Gura, looked about 12 and was spaced out on betel nut. Betel is the backy of the developing world, you get nuts, some mustard bin and some lime, mix it up and chew and it has a mildly hallucinogenic effect. The lads stand at the street corner and spit out the betel on the ground in sequence. There are notices in the tons telling people not to spit, the way we have notices telling people not to throw litter. They used to sell betel as part of the main market but because of al the spitting they now have a separate betel market. When they chew it, it turns their mouth red. Everyone’s mouth is red. The lime corrodes the teeth as well. Red and toothless and spaced out is the existence of a large part of the population here. It is a bit disturbing that masta is the word for white man in pidgin. Every where I go they call me “Masta Ow-ann” as if I was some sort of later day white slave plantation operator. It has its disadvantages. At the market place you are seen as a walking ATM. The group starts with four or five, then becomes 20, 50 and 200 in sequence. My day snorkelling was pleasant. We swam to the island that Robinson Crusoe landed on (or at least my compatriot Pierce Brosnan when he played Crusoe in the 1994 version movie) and splashed around in the shallows for a couple of hours. I do not know what I saw, in that underwater wonderland, crabs moving house, fish grazing, large waving anemones, with friends like that etc. I relearned a very important nautical lesson, how unforgiving coral is when you come into contact with it. I have coral scars again, for about the twentieth time. My knee is still damaged form coral scars from three years ago. Slow learner. Add to that the mosquito feast that descended on me as I did a late night swim AND an early swim. The proximity to the beach was too tempting. Having 830 languages in one country is CRACKED. 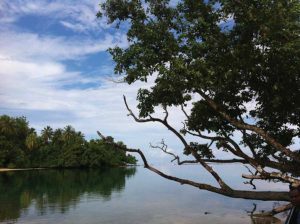 In Madang there are 170 languages in one province. Where I stayed in Madang the language stopped at the river. Beyond that is the Rempi tribe. They cannot understand what the Bagilig tribe are saying, including my guide Kaut Idel and driver Bugau Damon. They have taught me a few words in the Em dialect of the Darus language. This is important, because the Ea dialect of the Darus language cannot always understand what the Em dialect speakers are saying. ILUK. I am like a little boy who has learned my first swear-word, launching it at everyone whether they deserve it or not, iluk – for good morning. ILUK. ILUK. ILUK. Everyone smiles and replies, glad I have made the effort until the woman who has come to do the garden arrives with her angry looking machete. She doesn’t speak our language, Kaut says. She is from four miles up the road. Mount Hagen Sung Sing held once per year with Unesco support, a great way to see a huge range of diverse cultures in two days. The national museum in Port Moresby has an excellent collection of folk art from all around the country. Try the excellent black mountain coffee.